Your business is at risk. The US government is handing out multimillion-dollar fines to businesses that fail to comply with the stringent rules of electronic patient health information (ePHI). What are your requirements? Those in the medical fields must bring in outside risk analysis experts to identify issues in your computer network that could adversely affect ePHI. Don’t lapse in compliance. Missteps can often result in expensive fines, increased insurance premiums. Not to mention damage to your reputation. Yes, maintaining HIPAA compliance on an ongoing basis is tricky business. Trust the AdRem Healthcare IT Services for HIPAA Compliance. Our precise auditing generates short- and long-term mitigation strategies to reduce risks. We look beyond external threats. We scan your entire network each day for internal threats, alerting you of suspicious activities. Our next-generation security configurations put your computer equipment and devices that store patient data on lockdown. A reconfigured security framework keeps your infrastructure and data in HIPAA compliance. We proactively monitor, manage and diagnose the status of your devices and networks: a single source at the heart of your infrastructure. We design a continuity plan around your workflow, enabling you to get back to business seamlessly after disaster. We pummel your system with tests, all to improve your overall security, IT architecture and reduce the likelihood of cyber attack. After thorough analysis, we make recommendations on how your IT can better contribute to the success of your business. Failure to comply is not an option. 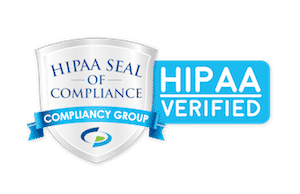 But managing your HIPAA compliance and maintaining government-mandated security levels is a time-consuming effort, requiring specialized IT expertise. See how the AdRem HIPAA process works. We’re ready to answer your HIPAA questions.